Donald Kirby Ross was born in Beverly, Kansas, on December 8, 1910, and enlisted in the United States Navy in June 1929. He rose through the enlisted ranks, was warranted Machinist in 1940, and joined the crew of the battleship USS NEVADA (BB 36) in November 1940. As a junior Warrant Officer onboard USS NEVADA, Ross earned the Medal of Honor for "extraordinary courage and disregard of his own life during the attack on the Fleet at Pearl Harbor" on December 7, 1941, according to the citation accompanying his award. "When his station in the forward dynamo room became almost untenable due to smoke, steam and heat," the citation continues, "he forced his men to leave that station and preformed all the duties himself until blinded and unconscious. Upon being rescued and resuscitated, he returned and secured the forward dynamo room and proceeded to the after dynamo room, where he was later again rendered unconscious by exhaustion. Upon recovering consciousness, he returned to his station, where he remained until directed to abandon it." Ross was presented the Medal of Honor by Admiral Chester Nimitz on April 18, 1942, and was commissioned Ensign in June 1942. Later in the war, he also participated in the landing at Normandy and Southern France. Ross retired in July 1956 as a Captain after 27 years of consecutive active duty aboard every type of surface ship then afloat. ROSS' keel was laid on April 10, 1995 in Pascagoula, Mississippi and her christening was held one year later. ROSS' plankowning crew moved aboard in April 1997 and sailed her to Galveston, Texas for the Commissioning on 28 June 1997. After commissioning, ROSS sailed on a six-week Combat Systems Ship Qualification Trial and then traveled back to Pascagoula for a three-month Post Shakedown Availability (PSA). ROSS then returned to her homeport of Portsmouth, Virginia and completed the Basic Training Phase including Engineering Certification, CART II, TSTA I, and III, Cruise Missile Tactical Qualification, Final Evaluation Period (FEP), and Logistics Management Assessmen. ROSS completed the Intermediate Training Phase and in early 1999, she sailed with the THEODORE ROOSEVELT Battle Group for a Joint Task Force Exercise in preparation for a six-month deployment commencing on March 26, 1999. During this deployment to the Mediterranean and Adriatic Seas, ROSS participated in Operation Allied Force. On September 22, she returned to Norfolk, Va.
On May 15, 2000, she got underway for Northern Europe to participate in Baltic Operations (BALTOPS) 2000. She served as flagship for Commander Carrier Group Eight and together with the USS PETERSON (DD 969) she operated with more than 50 ships from numerous European countries. During the exercise the destroyer visited Stockholm, Sweden and Kiel in Germany before returning to the United States in late June. In September 2001, USS ROSS deployed to the Mediterranean Sea and Arabian Gulf supporting Operation Enduring Freedom and conducting operations in support of UN resolutions against Iraq. 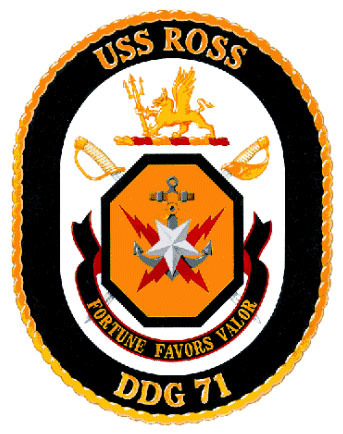 During the deployment, ROSS was part of the THEODORE ROOSEVELT (CVN 71) Battle Group. The Shield: The gold and dark blue on the shield of the coat of arms represent the Navy. The anchor stands for the anchorage at Pearl Harbor, attacked December 7, 1941, by Japanese aircraft, bringing the United States into World War II. The lightning flashes symbolize the unexpected assault and resulting bloodshed. The ship's propeller represents Warrant Officer Ross and the badge of a Navy machinist, a post he held at the time of the action. His heroism during the attack is recalled by the inverted silver star which stands for the Medal of Honor he won for valor on board the battleship USS NEVADA. 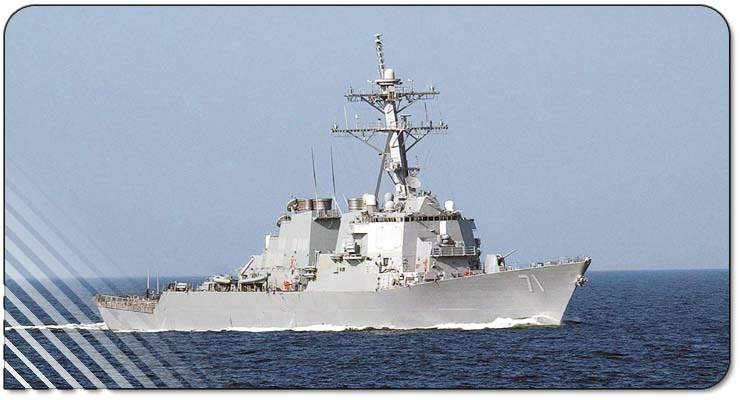 The shape of the shield refers to the Aegis armament and capabilities of DDG 71. Gold stands for excellence, red for courage. The Crest: The griffin on the crest, noted for vigilance, intelligence and valor, reflects the versatility of the DDG 7l's operating capabilities. It holds a trident denoting the range of USS ROSS's offensive equipment and firepower.